Ursula K. Le Guin left behind a legacy unparalleled in American letters when she passed away this January at the age of eighty-eight. Named a Living Legend by the Library of Congress for her contributions to America’s cultural heritage—the author of more than sixty books of fiction, poetry, creative nonfiction, children’s literature, drama, criticism, and translation—she was one of only a select few writers (the others being Eudora Welty, Saul Bellow, and Philip Roth) to have their life’s work enshrined in the Library of America while still actively writing. She joined the likes of Toni Morrison, John Ashbery, and Joan Didion in receiving the Medal for Distinguished Contribution to American Letters by the National Book Foundation, and her work garnered countless awards: the National Book Award, the PEN/Malamud, six Nebulas, six Hugos, and twenty-one Locus awards among them. Her name regularly appeared on the Nobel Prize for Literature short list, and writers as varied as Neil Gaiman, Salman Rushdie, David Mitchell, and Zadie Smith herald her as an influence. 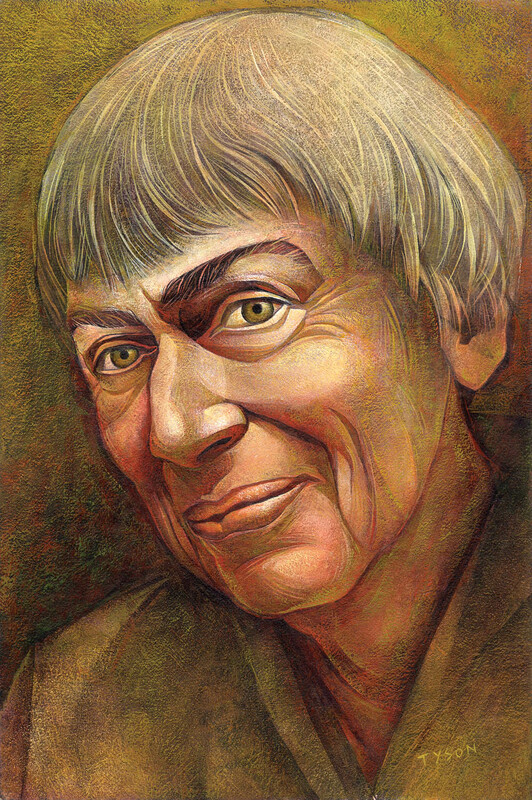 I believe you could start anywhere in her vast canon of work—with her poems, her translations of Gabriela Mistral or Lao Tzu, her remarkable book reviews, or her activism on behalf of writers, women, and the environment—to begin to understand the importance of Ursula K. Le Guin to both the world of letters and the world at large. But she was best known for her fiction, most notably her novels, and most specifically her books of science fiction and fantasy. And fiction, the genre she admittedly felt most comfortable talking about, was the occasion for the conversation that follows. Similarly, in the essay “The Operating Instructions,” she talks about the idea of “home,” that home is not one’s family or one’s house but something imaginary: “Home, imagined, comes to be. It is real, realer than any other place, but you can’t get to it unless your people show you how to imagine it—whoever your people are.” Le Guin found her home, the people who would show her how to imagine it, in her late thirties. After suffering many years of rejection submitting her work to both traditional and science fiction and fantasy magazines, she finally started receiving acceptances within the genre world, a world that seemed to both recognize and invite the unconventional aspects of her work. It wasn’t long before it seemed like she was bursting upon the scene at breakneck speed. The first decade of her career, beginning in the sixties, included some of her most well-known works of fiction: A Wizard of Earthsea, The Left Hand of Darkness, The Dispossessed, and The Lathe of Heaven. Each of these works imagined not just worlds, but homes, homes that became real for her readers, homes where protagonists were women, people of color, gender fluid, anticapitalist—imaginary homes that did not simply spin out our worst dystopic fears for the future like so many of the apocalyptic novels of today, but also modeled other ways of being, other ways to create home. This interplay between the fictional and the real is at the heart of Le Guin’s work. Thus it is no surprise that Occupy Oakland activists fashioned shields to appear like the cover of Le Guin’s anarchist utopian classic The Dispossessed during the 2008 protests—another example of the imaginary finding its way into the very real streets of our day. But one of the more magical aspects of both Le Guin’s work and presence in the world is the ways in which the importance of the imagination finds itself animating not only the stories she tells and the people inspired by them, but the smaller, more ordinary, seemingly trivial choices that make the stories come into being. When we met to discuss fiction, we met less to discuss her own than to discuss the craft of writing it. And remarkably, even here when talking not about the story itself but about its mechanics, we find that the question of imagination still reigns supreme for Le Guin. Engagement with great writing was of utmost importance to her as a pedagogical tool. She taught Native American stories, and she taught from the work of Woolf, Dickens, Atwood, Tolkien, recognizing them all as literary, as literatures, stepping into and teaching from an imagined future where they all would be recognized as such. And she engaged with grammar—pronouns, tense, point of view, sentence length, and syntax—as just as important a place to imagine home as the world of Earthsea or the streets of Oakland. Le Guin mounted a resistance to the “grammar bullies,” enforcers of rules of language that she considered fake rules, rules that mainly served to entrench power dynamics across class, gender, and race. And yet she urged writers to embrace and engage with the rules of style, to know a writer’s toolkit, to use it to open up the sentence and the story as fields where a writer could step toward the future one wants to live in. We don’t live in most times, most places. “Fake rules” and “alternative facts” are used in our time not to increase moral understanding and social possibility but to increase power for those who already have it. A war on language has unhinged words from their meaning, language from its capacity as truth-teller. But perhaps, counterintuitively, it is in the realm of the imagination, the fictive, where we can best re-ground ourselves in the real and the true. David Naimon: You’ve often talked about the importance of sound, that the sound of language is where it all begins, and that language is, at its core, a physical thing. Ursula K. Le Guin: I hear what I write. I started writing poetry when I was really young. I always heard it in my head. I realized that a lot of people who write about writing don’t seem to hear it, don’t listen to it, their perception is more theoretical and intellectual. But if it’s happening in your body, if you are hearing what you write, then you can listen for the right cadence, which will help the sentence run clear. And what young writers always talk about—“finding your voice”—well, you can’t find your own voice if you aren’t listening for it. The sound of your writing is an essential part of what it’s doing. Our teaching of writing tends to ignore it, except maybe in poetry. And so we get prose that goes clunk, clunk, clunk. And we don’t know what’s wrong with it. Beneath memory and experience, beneath imagination and invention, beneath words, there are rhythms to which memory and imagination and words all move. The writer’s job is to go down deep enough to feel that rhythm, find it, move to it, be moved by it, and let it move memory and imagination to find words. That is something that I learned from Virginia Woolf, who talks about it most wonderfully in a letter to her friend Vita. Style, she says, is rhythm—the “wave in the mind”—the wave, the rhythm is there before the words, and brings the words to fit it. You’ve cited Woolf as perhaps the best example of the use of rhythm. She’s an amazing example of the use of a long and subtle rhythm in prose. But there are many, many others. I wrote an essay about the rhythm of Tolkien’s writing in The Lord of the Rings. Short rhythms repeated form long rhythms; there’s a cyclical repetition in his work which I think is part of why it totally enchants so many of us. We are caught in this rhythm and are happy there. You emphasize the importance of understanding grammar and grammar terminology but also the importance of interrogating its rules. You point out that it is a strange phenomenon that grammar is the tool of our trade and yet so many writers steer away from an engagement with it. In my generation and for a while after—I was born in 1929—we were taught grammar right from the start. It was quietly drilled into us. We knew the names of the parts of speech, we had a working acquaintance with how English works, which they don’t get in most schools anymore. There is so much less reading in schools, and very little teaching of grammar. For a writer this is kind of like being thrown into a carpenter’s shop without ever having learned the names of the tools or handled them consciously. What do you do with a Phillips screwdriver? What is a Phillips screwdriver? We’re not equipping people to write; we’re just saying, “You too can write!” or “Anybody can write, just sit down and do it!” But to make anything, you’ve got to have the tools to make it. You’ve said that by diagramming sentences, you discover that they have skeletons. It’s interesting to think that if sentences have skeletons then different sentences are, in a sense, different animals. This would bring us back to rhythm, as sentences would all have a different rhythm, a different sound, because they would walk differently. A different gait, right. Although all the sentences in a piece would also be following a certain underlying, integrating rhythm. This difference between grammatical correctness and the ways language engages moral questions reminds me of this quote of yours: “We can’t restructure society without restructuring the English language.” That the battle is essentially as much at the sentence level as it is in the world, and it’s reflected in your work as well. I think of The Dispossessed, your novel about an anarchist utopia. There is no property in this imagined world and there are also no possessive pronouns. The world and the language of the world are reflecting back upon each other. The founders of this anarchist society made up a new language because they realized you couldn’t have a new society and an old language. They based the new language on the old one but changed it enormously. It’s simply an illustration of what Orwell was saying in his great essay about how writing English clearly is a political matter. Just as you’ve pointed out the erasure of women at the sentence level you’ve also voiced concerns about the ways in which women writers get disappeared from the conversation, particularly when it comes to entering or not entering the canon. I think in one conversation someone asked you for examples and you mentioned Grace Paley as someone sliding out of the conversation. I fear for Grace’s reputation, because it happens so often that a woman writer, very much admired but not best-seller famous, however admired by many critics, just slides out of sight after her death … and the place is filled by a man. Well, no man could possibly fill Grace Paley’s place. She wrote extraordinarily as a woman. And that may be part of the problem. You’ve been an outspoken critic of the increasing commodification of authors and how sales departments are taking over from editorial. That a lot of the choices that influence how a book is being shaped are less about art and more about commerce. You’ve pushed back against this and argued that literature shouldn’t just be viewed in terms of what’s in vogue. It doesn’t seem like you’re against what is in vogue, but you’ve tried to expand the conversation beyond popular contemporary choices in stories and novels, like present tense and very short sentences. There are advantages and disadvantages to living a very long time, as I have. One of the advantages is that you can’t help having a long view. You’ve seen it come and seen it go. Something that’s being announced as the absolute only way to write, you recognize as a fashion, a fad, trendy—the way to write right now if you want to sell right now to a right now editor. But there’s also the long run to consider. Nothing’s deader than last year’s trend. You’ve talked before about how past tense allows for more ready movement back and forth in time, that it more closely mimics the ways our minds and memories work. What is the cost/benefit trade-off when choosing past or present tense? It is particularly connected to telling a big story, a story with some real depth. But it is a complicated issue. Obviously, the present tense has certain uses that it’s wonderfully suited for. But recently it has been adopted blindly, as the only way to tell a story—often by young writers who haven’t read very much. Well, it’s a good way to tell some stories, not a good way to tell others. It’s inherently limiting. I call it “flashlight focus.” You see a spot ahead of you and it is dark all around it. That’s great for high suspense, high drama, cut-to-the-chase writing. But if you want to tell a big, long story, like the books of Elena Ferrante, or Jane Smiley’s The Last Hundred Years trilogy, which moves year by year from 1920 to 2020—the present tense would cripple those books. To assume that the present tense is literally “now” and the past tense literally remote in time is extremely naïve. The choice of first-person point of view is more popular today than ever. You’ve talked about how first person was mainly found in medieval diaries and saints’ confessions and then in Montaigne’s essays, and was not a big part of our literature until recently. Third-person limited is very similar to first person in that it is one point of view only. One or the other of those two do seem to be, over and over, the only point of view used in contemporary fiction. But it is actually pretty late in the history of literature that both these points of view arise. Henry James did the limited third person really well, showing us the way to do it. He milked that cow successfully. And it’s a great cow, it still gives lots of milk. But if you read only contemporary stuff, always third-person limited, you don’t realize that point of view in a story is very important and can be very movable. It’s here where I suggest that people read books like Woolf’s To the Lighthouse to see what she does by moving from mind to mind. Or Tolstoy’s War and Peace for goodness’ sake. Wow. The way he slides from one point of view to another without you knowing that you’ve changed point of view—he does it so gracefully. You know where you are, whose eyes you are seeing through, but you don’t have the sense of being jerked from place to place. That’s mastery of a craft. And you put forth that the omniscient point of view is a legitimate choice for contemporary writing. Any of us who grew up reading eighteenth- or nineteenth-century fiction are perfectly at home with what is called “omniscience.” I myself call it “authorial” point of view because the term “omnisicence,” the idea of an author being omniscient, is so often used in a judgmental way, as if it were a bad thing. But the author, after all, is the author of all these characters, the maker, the inventor of them. In fact all the characters are the author if you come right down to the honest truth of it. So the author has the perfect right to know what they’re thinking. If the author doesn’t tell you what they are thinking … why? This is worth thinking about. Often it’s simply to spin out suspense by not telling you what the author knows. Well, that’s legitimate. This is art. But I’m trying to get people to think about their choices here, because there are so many beautiful choices that are going unused. In a way, first person and limited third are the easiest ones, the least interesting. That’s when you shift from one person’s mind to another’s, the way Tolstoy and Woolf do so splendidly, but you do it awkwardly or you do it without knowing you are doing it. The thing about point of view is awareness. Changing it requires intense awareness and a certain amount of practice and skill in the shifting. Successful shifting gives binocular or more than binocular vision. Instead of a single view of an event, you do what Rashomon does, offer multiple perspectives, but without having to retell the story multiple times as Rashomon does. You can do it as you tell the story, and the multiple points of view lead to greater puzzlement or greater clarity about what is going on, depending upon what you want. I think the authorial point of view, because it allows such shifting, is the most flexible and useful of all the points of view. It’s the freest. What did you mean when you said that modernist writing manuals often conflate story with conflict? Well, to preach that story is conflict, always to ask, “Where’s the conflict in your story?”—this needs some thinking about. If you say that story is about conflict, that plot must be based on conflict, you’re limiting your view of the world severely. And in a sense making a political statement: that life is conflict, so in stories conflict is all that really matters. This is simply untrue. To see life as a battle is a narrow, social-Darwinist view, and a very masculine one. Conflict, of course, is part of life, I’m not saying you should try to keep it out of your stories, just that it’s not their only lifeblood. Stories are about a lot of different things. It’s amazing how quickly we fall into battle metaphors in common speech when speaking about almost anything. You have been very interested in Taoism and Buddhism over the years and translated your own version of the Tao Te Ching. You’ve said: “Some people see art as a matter of control. I see it mostly as a matter of self-control. It’s like this, in me there’s a story that wants to be told. It is my end. I am its means. If I can keep myself, my ego, my wishes and opinions, my mental junk, out of the way, and find the focus of the story, and follow the movement of the story, the story will tell itself …” This feels like a very different approach to story than one of willfulness to put something down on the page. Yes, that’s fairly Taoistic. That is wu wei, or doing by not doing. It seems very passive. Of course, Lao Tzu strikes the Western conflict-oriented mind as incredibly passive. “Don’t do something, just sit there.” That’s where he is so tricky and so useful. There are many different ways of just sitting there. I wonder if your own personal biography might also be a source of inspiration for people trying to find their feet as writers. It took you quite a while, of writing and submitting, before you saw any tangible success. More than most artists, maybe because they work so much in solitude, writers tend to self-doubt. And getting published is a formidable barrier. Starting out, I was able to place a poem every now and then—in one of the little tiny poetry magazines—eight or nine readers—but at least I was in print. But I couldn’t sell any fiction. For six or seven years I was methodically writing short stories and novels, trying to place them, and getting nowhere. Got lots of nice rejection slips. The fact is, I was committed to being a writer, to my writing, and I had a self-confidence or arrogance that carried me through. “I am going to do it, and I’m going to do it my way.” I stuck to that. And bang, I finally broke through. I sold two stories in one week, one to a commercial magazine and one to a little literary magazine. Once the door cracks open, it seems to stay open. It’s easier to know where to submit your work. My stories often weren’t conventionally realistic, but had some nonrealistic twist, and I realized that fantasy and science fiction magazines could read them and not say, “What is this?” There was an open mind there that I hadn’t met in the conventional markets. After this breakthrough, slowly but fairly steadily, I began to get the breaks. Of course, until I had an agent, I faithfully submitted my work, which is hard work. And this is the area I’m not sure I know how to talk about now—it’s so different, with the internet, e-publication, self-publication. About self-publication, for instance, I can’t even say I’m of two minds. I’m just trying to figure out what it really involves and where it really gets you as a writer. If you self-publish without any network of publicity, any way to make your work known, and if you don’t choose to sell yourself to advertisers—? I just don’t know. I don’t know. It’s wonderful to see your work in print, goodness knows, but how much good is that if nobody’s reading it outside your peer group and your relatives? I don’t know. Nobody has much solid advice to give anybody at this point. We’re in a revolution. David Naimon is the coauthor of Ursula K. Le Guin: Conversations on Writing (Tin House Books, 2018), from which this interview is adapted, and the host of the radio show and podcast Between The Covers. His work has been published in Tin House, AGNI, Fourth Genre, Boulevard, ZYZZYVA, and elsewhere, reprinted in the Best Small Fictions 2016, and cited in the 2016 Pushcart Prize volume, the Best American Essays 2015, and the Best American Travel Writing 2015. Sara Tyson has worked for thirty-five years as an illustrator and graphic designer.